Shing Au-Yeung was born and raised in Hong Kong. Like most boys of the time, he was a science pupil in secondary school. At university, he gradually migrated to social science and obtained a BA in Communication Studies from the University of Michigan. During that time, he also encountered video art from university courses and the Hong Kong Arts Centre workshops. Those experiences left a persistent mark in his life. In 2001, commissioned by the Hong Kong Film Archive, he made a video paying tribute to the retired director Lung Kong. The work was exhibited in 2001 and again in 2010. From 2001-2004, in every summer, he curated and taught the “Video-making day camp” for teenagers, jointly sponsored by the Leisure and Cultural Services Department, HKSAR and universities, including HKU. Recently, he designed and held workshops on “digital story telling” for various communities as part of the Hong Kong Memory Project. 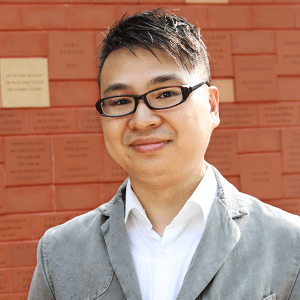 His research life began with the Baseline Study on Hong Kong’s Creative Industries (2003), conducted by HKU and commissioned by the Central Policy Unit of the Hong Kong government. Currently, he co-investigates a public policy research study on “independent” film and video practices in Hong Kong. Co-Investigator, “The Workforce and Professionalism of Film/Video Makers in Hong Kong: Youth, Industry, and Community-Building”. Funded by the Public Policy Research (PPR) Funding Scheme of RGC and the Central Policy Unit of HKSAR. 2012-2013. Teaching Consultant, Hong Kong Memory Project, a project of Hong Kong Institute for the Humanities and Social Sciences, HKU, sponsored by the Hong Kong Jockey Club Charities Trust. Examiner, Film and Media Arts, Hong Kong Arts Development Council.